The Glendon BioFilter septic system is a product born in Washington State, in the small county of Kitsap. Kitsap is a coastal peninsula, which is surrounded by water on all sides and full of many streams, ponds, and lakes. The soils range from a very gravelly, Type 1, to a glacial till that is as hard as concrete, in the Type 6 range. The majority of the soils are shallow in nature, which has made on-site systems very hard to design and install. If necessity is the mother of invention, then the Glendon is another one of those stories. About twelve years ago this problem was the focus of a weekly meeting between Mr. Glenn Helm, an on-site systems installer for many years, and his friend Mr. Don Vandervelde, a registered sanitarian. The discussions started over hot coffee and drawings on the back of napkins and led to the creation of the M-31 system that was the early test of their theories and talents. Little did they realize that they would revolutionize the on-site industry with a system that could produce an answer to the problems that have faced the industry for years--trying to design and install in those areas where the conventional systems couldn't meet the local codes for separation and setbacks. As the system progressed from experimental to alternative, it was found to be the perfect answer for the repair situation where the space to replace an existing system was very limited. This system also saved many building lots from being abandoned as useless because of poor soil conditions. The Saturday coffee sessions are not so often now, but the research still goes on into how the system can be made better and more versatile to the on-site industry. 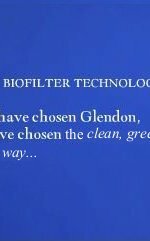 With the Glendon system, the forces and principles of nature are allowed to work on cleaning and disposing of the effluent in a simple and natural way which makes Glendon more reliable and easier to maintain than the sand filter and aerobic systems normally used . If you have chosen Glendon®, you have chosen a winner...naturally!